Social scientists have long recognized that solidarity is essential for such phenomena as social order, class, and ethnic consciousness, and the provision of collective goods. 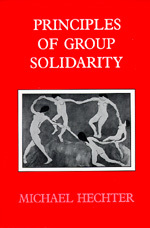 In presenting a new general theory of group solidarity, Michael Hechter here contends that it is indeed possible to build a theory of solidarity based on the action of rational individuals and in doing so he goes beyond the timeworn disciplinary boundaries separating the various social sciences. Michael Hechter is Professor of Sociology at the University of Arizona.